This card, pulled in the upright position represents wisdom, integrity, knowledge, and confidence in one's life. When I look at this card, I see a goal to attain in my own life or recognize the need to seek out or encourage a relationship with a mentor, elder or person who is comfortable in their own skin. In the window, there is a lemon balm plant in a pot on the sill. Lemon balm is a wonderful herb which can be used to calm nerves or anxiety, soothe depression and aid in sleep as needed. Within this picture, Lemon Balm represents comfort, career, success and sympathy. In the foreground, a ferret romps at the elder man's feet as a representation of gentleness, ingenuity and security. For me, the ferret also represents peace and happiness. 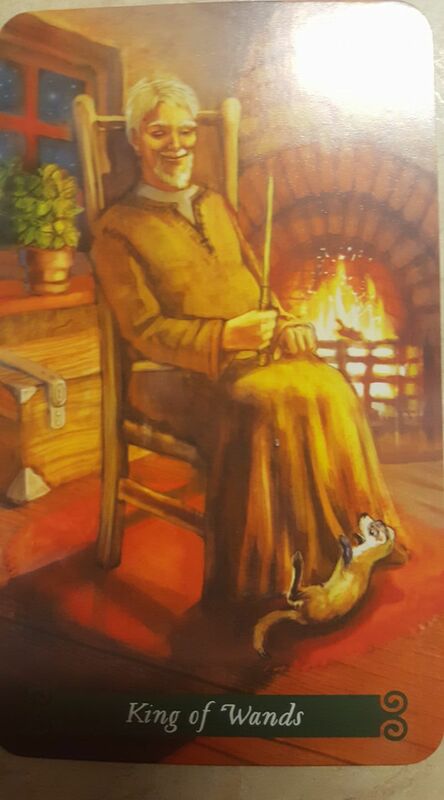 I see this card as encouraging us to seek or embrace wisdom and knowledge in our lives (and never forgetting to take time to sit back, relax and enjoy the little things in life).